After being rescued from forced labor, elephants Jokia and Mae Perm had the longest running friendship at their sanctuary, Thailand's Elephant Nature Park (ENP). For 17 years, Mae Perm and her blind friend Jokia have been inseparable. But there's just one thing the friendship couldn't overcome. This week, Mae Perm passed away of old age. Jokia's broken heart is unmistakable. "We gave to Jokia a long time to be with her great love," Lek Chailert, founder of ENP, wrote on Facebook on Friday. "She stood over her for almost six hours, touching and nudging and leaning against the lifeless body of Mae Perm." 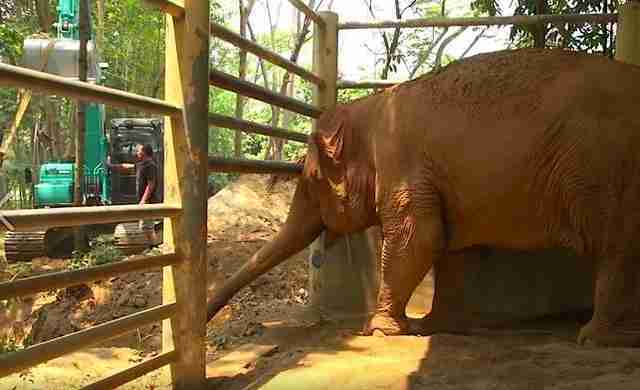 "Jokia did not eat much during the whole morning, and when she went to get some melons at the other end of her shelter, we took advantage of the moment to pull Mae Perm's body out of the room and gently down into her final resting place," Chailert wrote. The people at ENP are doing everything they can to support Jokia through her grief, as they too grieve the loss of Mae Perm. "Jokia did come right over as we moved the body, and she touched Mae Perm, moaning painfully as her friend slipped away from her forever," Chailert wrote. "We feel her pain."